As a gluten and dairy-free diner, I meticulously research restaurant options whenever I know I will be dining out. Most of the restaurants I visit are selected from this process, but in the case of Viva Chicken in Charlotte, NC, my decision to dine there was based purely on a whim. I was visiting North Carolina for the holidays, and my mom and I were out running errands after Christmas. 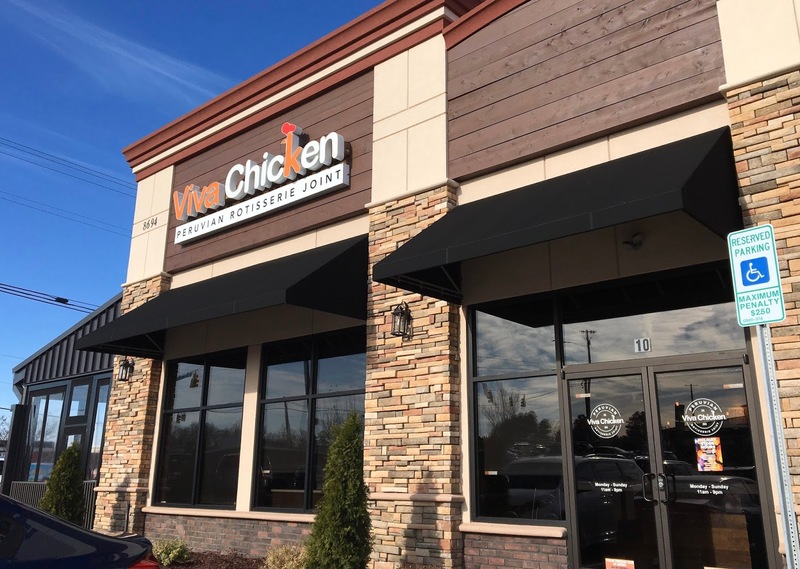 We had already planned on stopping by Sabor Latin Street Grill (a place I had reviewed before), when we spotted Viva Chicken. The location was convenient and was closer to the stores we wanted to go to, so we pulled in to see what (if any) gluten-free options were available. Once confirming they were allergen-aware I couldn't wait to to put their food to a taste test. Without spoiling the review at the get-go, I can definitely say that this surprise find of a restaurant delivered one of my favorite dining experiences all year. In the past few weeks I've let pending reviews pile up, because I have been in the midst of graduating college and moving to DC in addition to the usual stressors of the holiday season. 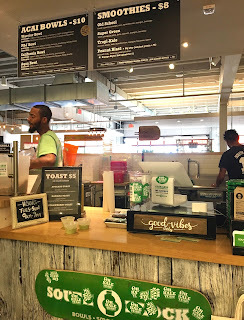 Now that the pace of life has slowed a bit, I am excited to share a new foodie find I discovered in my last week as a Maryland resident: Grabbagreen. While Grabbagreen can be categorized as a fast food restaurant for their quick-serve model of service, don't mistake this restaurant with others in the category who cut corners and value speed over quality ingredients. 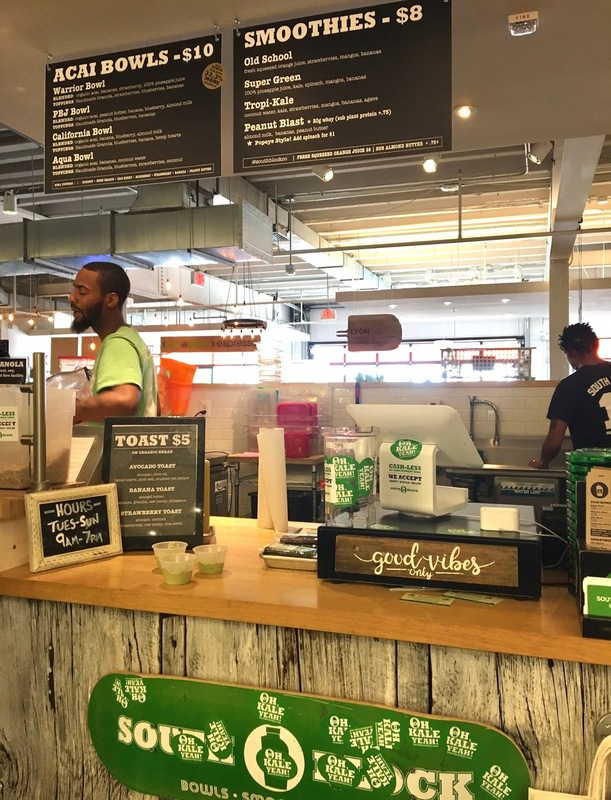 Grabbagreen builds their menu using fresh, farm-to-table, locally sourced ingredients to craft juices, salads, and meals that nourish and satisfy. This is a place you don't have to feel guilty stopping at if you need to eat on the fly! Although my return to Central Florida for Thanksgiving was brief, I did manage to get some foodie tourism in. 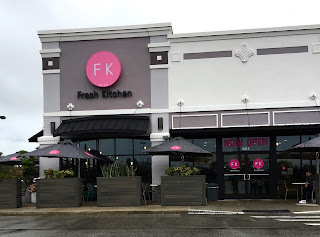 After touching down at Orlando's airport, my mom suggested checking out Fresh Kitchen for lunch. With a 100% gluten-free menu and allergy-awareness for other allergens, I was easily sold. 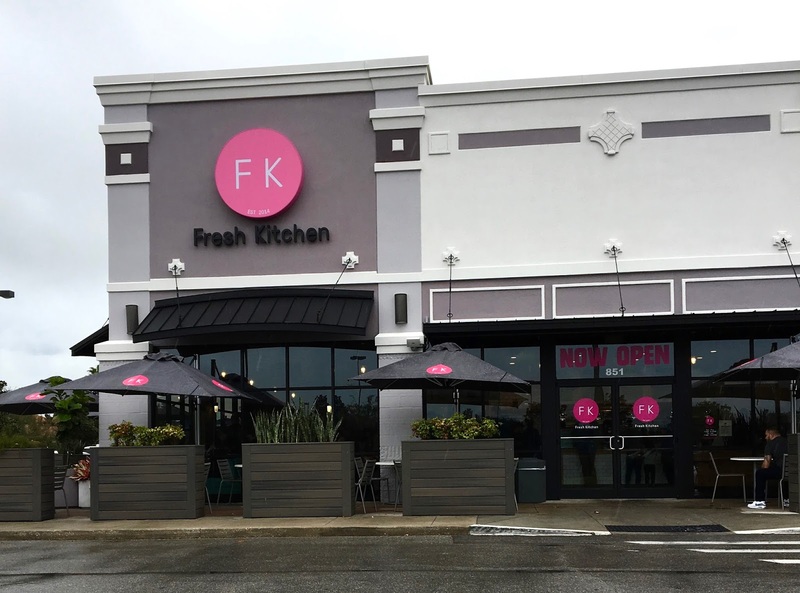 Fresh Kitchen is a Florida-based chain with locations dotted around the state. The location I visited (Waterford Lakes) opened just a few months ago, and Central Florida will be getting a second location soon (in SoDo). 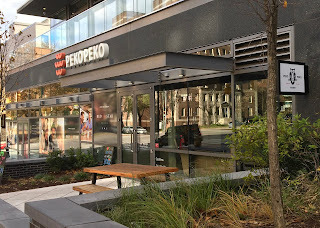 Promising "chef-inspired" bowls, Fresh Kitchen uses premium ingredients but prepares them in an accessible way that is approachable for anyone regardless of dietary preference. Of all the smoothie/acai bowl places I have found in Washington DC, Fruitive holds a special place in my heart because they have a 100% plant-based menu and their smoothie bowls (my review) are always swoon-worthy. Staying overnight in Washington DC one weekend, I woke up wanting to find some place to find "breakfast" food. Usually I opt for a piece of fruit and a protein bar as my preferred breakfast when traveling, but on that occasion I just wanted something more substantial. I decided to head out to Fruitive for an acai bowl, but realized when reading their menu that they have new gluten-free offerings- waffles, soups, and collard tacos. Ardenne Farm is one of my favorite gluten-free companies, because their fool-proof mixes always yield gloriously delicious and crowd-pleasing baked goods. Whenever I serve up sweets to my friends or family, usually the "secret recipe" is Ardenne Farm's mix. The company's three newest mixes are their lemon poppy seed muffins, pumpkin streusel muffins, and snickerdoodle cookies. All three are gluten-free and vegan, which makes accommodating multiple allergens less of a headache. As the temperature has been falling here in Maryland, I figured it was prime time to test out these mixes out. 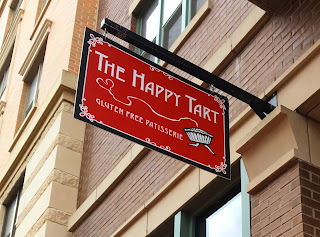 I adore the Virginia-based bakery The Happy Tart. This 100% gluten-free patisserie is dream come true for celiacs or anyone who cannot have gluten, as each pastry is more tantalizing than the next. With my mom visiting for the weekend, we decided to plan on enjoying The Happy Tart's weekend brunch. Although I have popped in several times for cupcakes, cookies, and bread, I was excited to partake in their full service brunch, and have been waiting for an occasion to stop by and celebrate. Brunch at the happy tart is a festive affair, with plenty of sweet and savory options to peak your interest. While dairy does limit some options nothing beats the peace of mind of knowing that everything is safely gluten-free. As a college student, I am ashamed to admit that I don't eat as healthily as I should. I know that I need lots of fruits, vegetables, and protein in my diet but between class, work, and other commitments, I find that I rarely have a spare hour in the kitchen to whip up a balanced meal. I turn more often than not to frozen, canned, or packaged meals to get me through my jam-packed schedule, so I try to find options that use real food and still taste good. 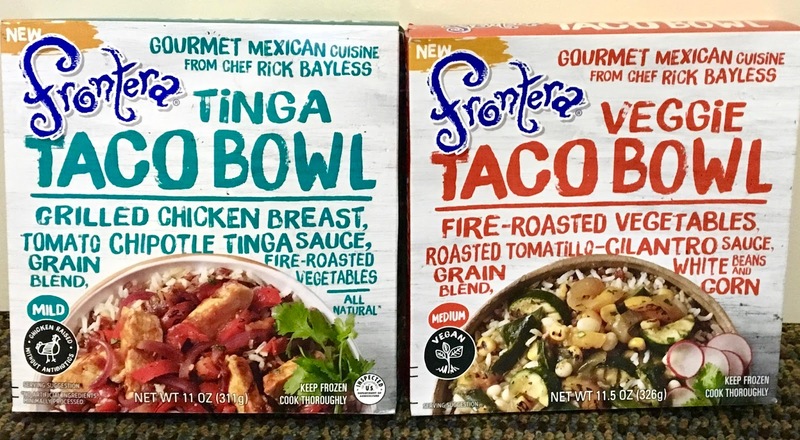 On a recent grocery trip through my local Safeway, I spotted Frontera's new frozen taco bowls. The company is already one I trust from their line of delicious chips, salsas, and their gluten-free friendly restaurant in Disney Springs so I couldn't wait to see if these frozen creations could deliver the quality I have come to expect from this brand. If there's one thing the world needs more of, it's smoothie shops that use real ingredients. As a busy college student, smoothies are an essential part of my diet, as they enable me to consume much needed nutrients quickly and in a delicious fashion. 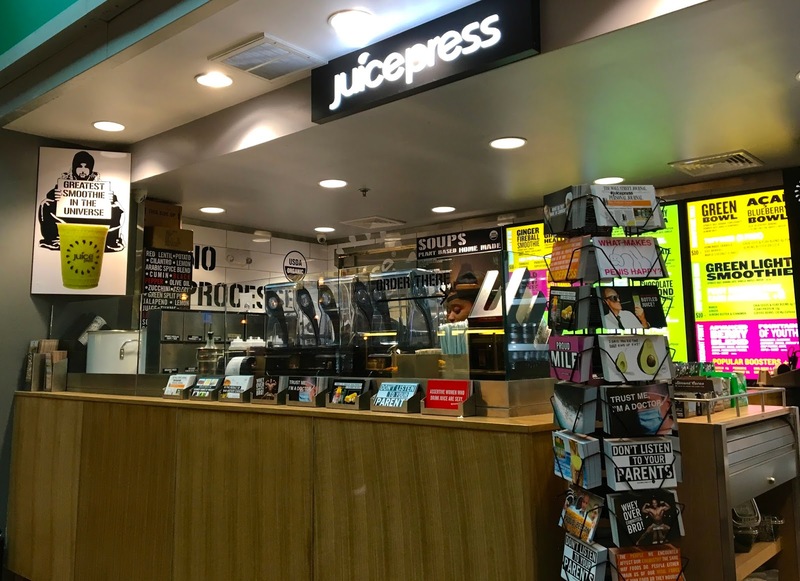 When the New York City-based smoothie chain Juice Press announced that they were opening a store in DC's Union Station, I jumped for joy because I frequent this busy transit hub on a weekly basis as I travel back and forth between DC and Baltimore. In the past, gluten-free options have been a bit limited (RIP Shophouse), so I was eager to have Juice Press as a healthy option going forward. As a gluten-free eater, tacos are one of my favorite genres of food because they are so easily adapted to be gluten and dairy-free. 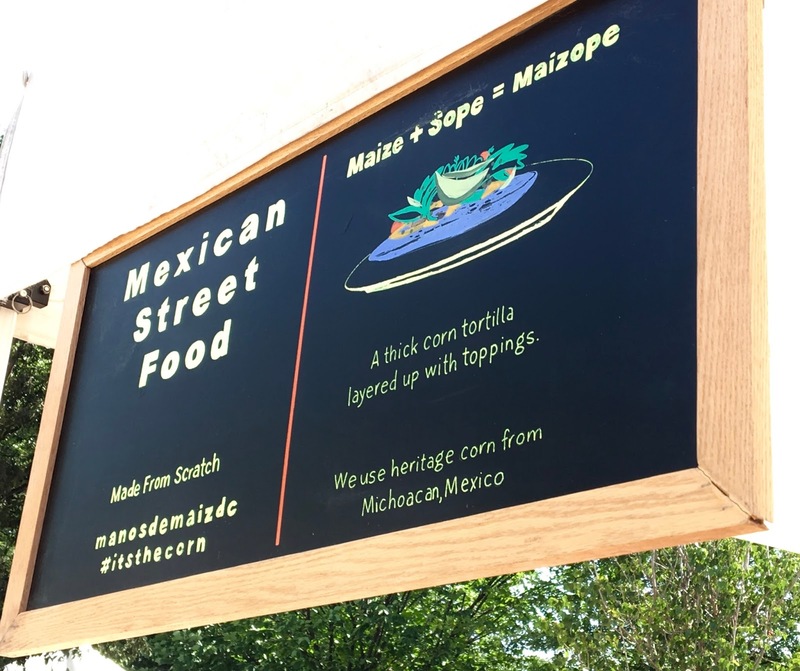 When I heard a new all-veggie-centric taco joint was coming to Washington DC's Brookland neighborhood, I immediately bumped it to the top of my never-ending list new restaurants to try. 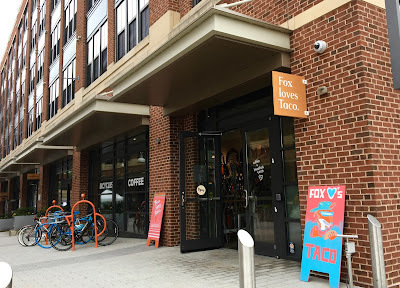 Fox Loves Taco is this decidedly hip taqueria. Open from the early hours of the morning to early evening, they serve up breakfast tacos all day, and prove that tacos a perfect meal any time of day. With a menu that has something for everyone to love (even with dietary restrictions), don't be deceived by its humble location inside a bicycle shop. I don't eat as much pizza as I used to when I first started this blog. I blame some stellar gluten-free pizza experiences for this because once you've had a good gluten-free pizza, it's hard to settle for an often overpriced, cardboard-tasting pathetic pizza. After hearing positive reviews about Washington D.C.'s Pi Pizzeria, I decided to pay them a visit, lured by the promise of delicious pizza prepared safely. Even President Obama has sung the praises of this pizzeria! 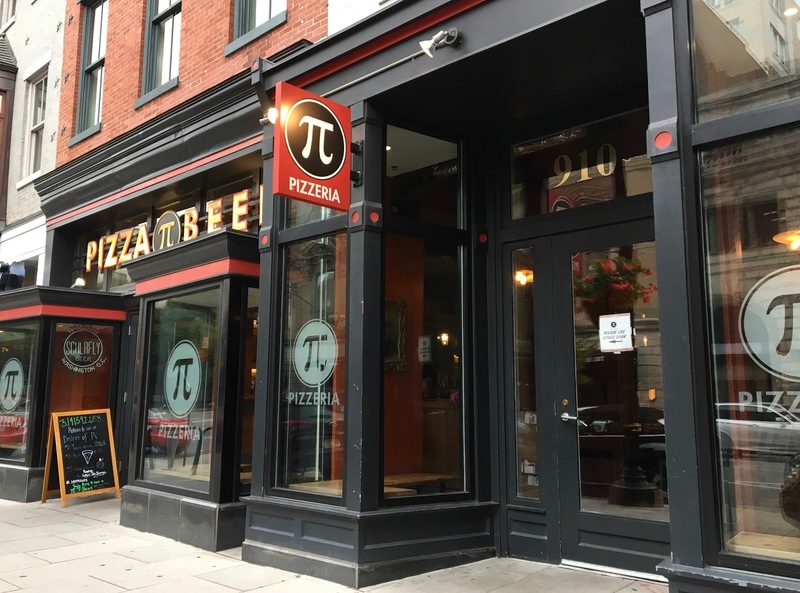 Located in the heart of downtown D.C., Pi Pizzeria is conveniently located just a few steps from Ford's Theatre, the Smithsonian American Art Museum, and the White House- not a bad place to be when you want to stop for a slice between sightseeing. As I was soon to discover, their great location was only the start of a great experience. As a busy (and always hungry) college student, I am always looking for portable snacks that satisfy in the moment but also have good-for-you ingredients. On a recent pass through the gluten-free product aisle at my local Safeway, I spotted a new-to-me product: The Good Bean's Favas and Peas. Always game to try plant-based foods that sneak protein into my diet, I bought one each of their sea salt and habanero citrus pouches to try. Both varieties are gluten-free, vegan, peanut-free, and contain 7 ounces of protein in every one-ounce serving- that's equivalent to the protein in one extra large egg! The name of the product couldn't be more fit, as the main ingredients are roasted fava beans and peas that have been crisped up after soaking. With a spritz of coconut oil and all natural seasonings, these definitely have a health halo with every handful. One of my favorite things about living in Orlando a few years ago was enjoying the thriving food truck culture. 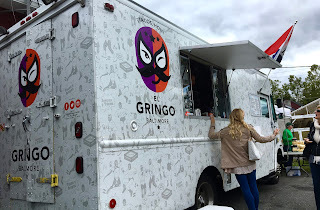 It was fun to follow my favorite trucks to neighborhoods all around the city and I managed to find a handful of trucks that served up reliably gluten-free fare. Now that I live in Baltimore, my food truck wanderings are more limited, as I have struggled to find gluten-free safe options. However, when I learned that a 100% gluten-free truck had entered the scene, I knew it would only be a matter of time before I sought it out for a review. Enter El Gringo Baltimore, a chef-driven truck that promises to bring locally-sourced tacos and arepas to the masses. 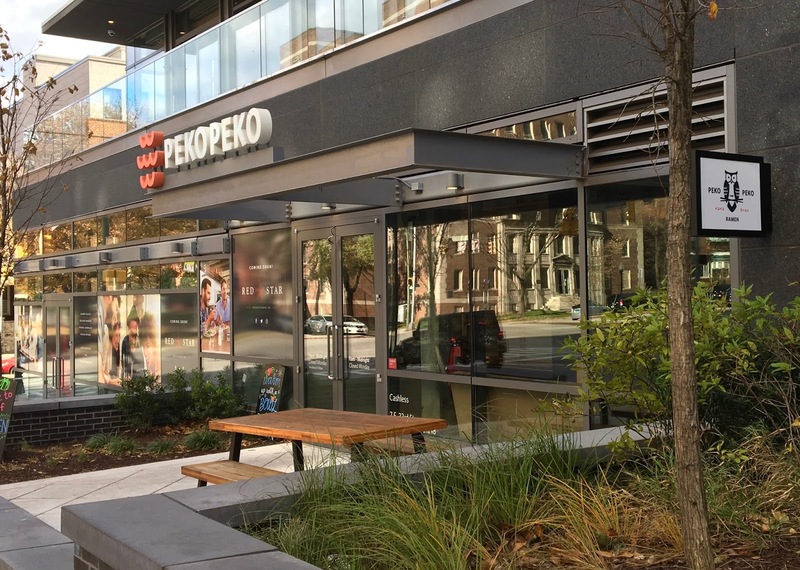 Having won acclaim as one of Baltimore's "best food trucks" by the Baltimore Sun and winner of the "best breakfast sandwich in America" by Restaurant Hospitality magazine, they've made quite an impressive early go of it. When it comes to "fast food" Mexican restaurants, I have always held the less-than-popular opinion that Qdoba is the best of the chain restaurants out there. 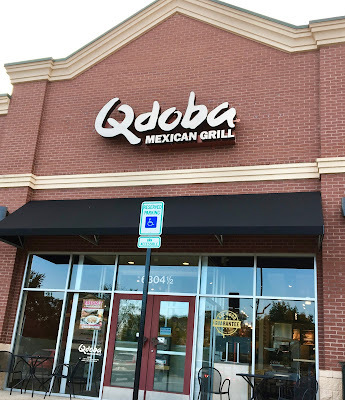 With flavorful food and lots of gluten-free and dairy-free options to choose from, I've never had a bad meal from Qdoba... plus their guacamole never incurs an extra charge! Since Qdoba is not 100% gluten-free, knowing how to navigate the menu is important, as there are gluten-filled items on the menu. As with any fast food restaurant, visiting on off hours or when the restaurant first opens can make explaining food restrictions and navigating the assembly-line style of the restaurant easier and safer. With locations around the country, Qdoba can be a familiar and reliable restaurant when traveling or when you're in a rush. 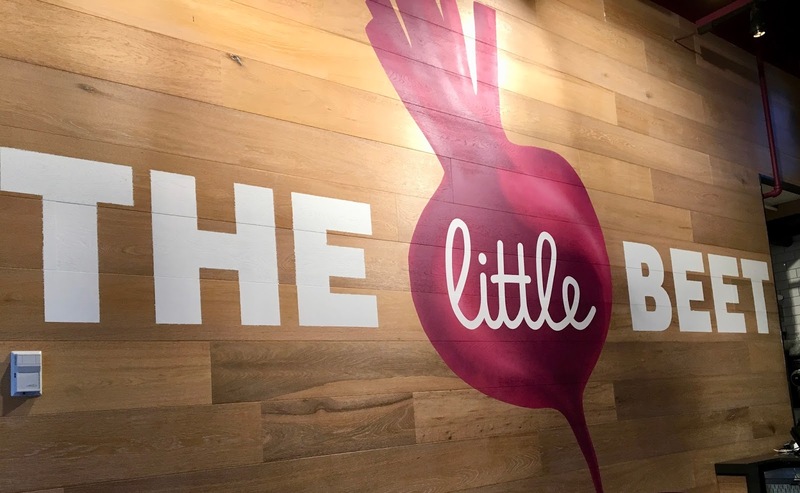 For gluten-free foodies, The Little Beet is a gluten-free haven in Washington DC. This New York City export is 100% gluten-free, and promises seasonal fare, farm-to-table ingredients, and peace of mind when dining out. 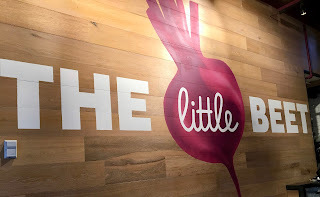 Since my first review of The Little Beet, their menu and options have changed enough to warrant an updated blog post. The menu has been reorientated around design-your-own bowls, with a rice, grains, or salad as a base. While some options have been cut in the process, there's still plenty to choose from and an endless array of combinations possible. Of course I stopped by a couple times to taste around this new menu as official "research." I always have, and always will. As a gluten-free blogger (and bread lover), I am always in search of the latest and greatest gluten-free bread options. From breads found at my local grocery stores to ordering from bakeries across the country, I never pass up an opportunity to try a new-to-me brand. 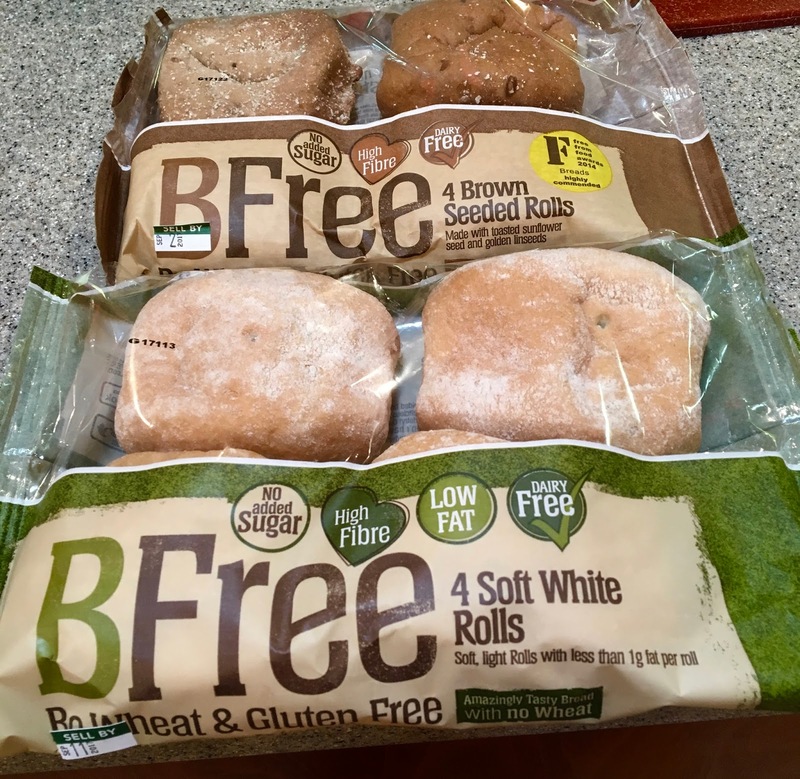 When visiting North Carolina, a Publix trip introduced me to BFree, a wheat and gluten-free bakery that stands out in the normally gluten-filled bakery section of the store. BFree is an Irish company, and their whole line of products are allergen-free and vegan-friendly. Offering pita, rolls, bagels, loaves, and wraps, BFree's product line has a great variety of common and more uncommon gluten-free bread types. Of many BFree items stocked, their dinner rolls jumped out to me, because good gluten-free dinner rolls are few and far between. 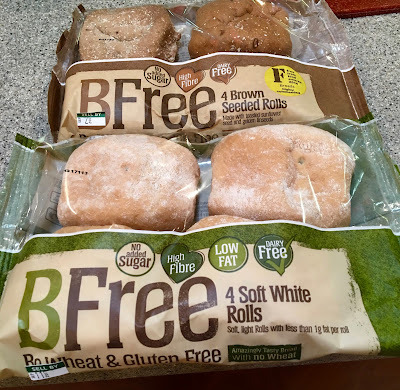 With a white and whole grain/seeded variety, I was eager to see how BFree's rolls would measure up. After spending the summer in Washington D.C., I really enjoyed getting away from that town's hustle and bustle as I visited family in North Carolina to finish out my summer break from school. 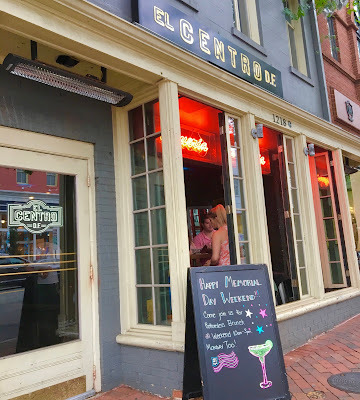 Always on the hunt for gluten-free food options, I quickly identified Primal Food and Spirits as a great lunch spot when passing through Durham on my way back to Baltimore. 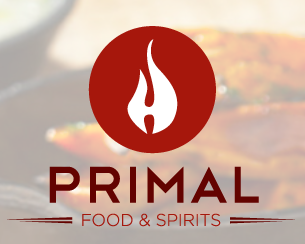 Primal Food and Spirits is a 100% gluten-free eatery that has a back-to-basics approach to dining. With unprocessed fare and homegrown ingredients, dining here promises to be worry-free, as cross contamination is a non-issue and every dish is thoughtfully crafted. Since I have family in Western North Carolina, I like to make plans to visit multiple times a year. As a city dweller, I enjoy the abundance of beautiful scenery to be had in the mountains and foothills of the Blue Ridge Mountains, and eating southern food that is hard to find in the mid-Atlantic. 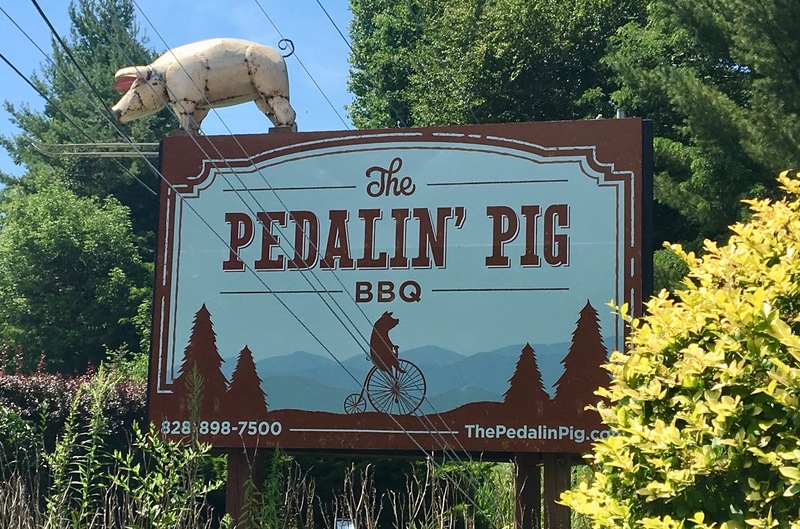 When planning a day trip to Grandfather Mountain with my aunt and uncle, a quick Find Me Gluten-Free search led me to The Pedalin' Pig, a barbecue joint in nearby Banner Elk that was very promising when it came to gluten-free options. With gluten-free buns available and plenty to choose from on the menu, I was sold; any chance I have to get authentic gluten-free barbecue I take it. 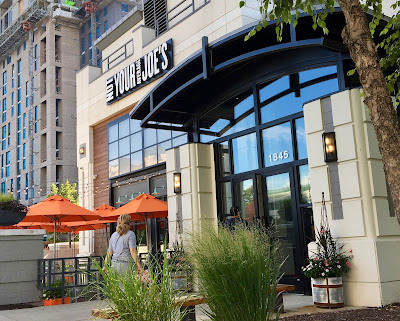 From one location in Dartmouth, Massachusetts to over 20 locations today, Not Your Average Joe's has made a name for itself by focusing on from-scratch cooking and unparalleled service. 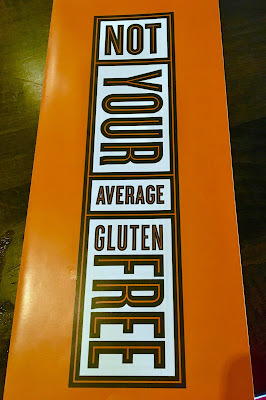 I've heard for awhile that Not Your Average Joe's had a great gluten-free menu- and even better- a can-do attitude when it comes to dietary restrictions. 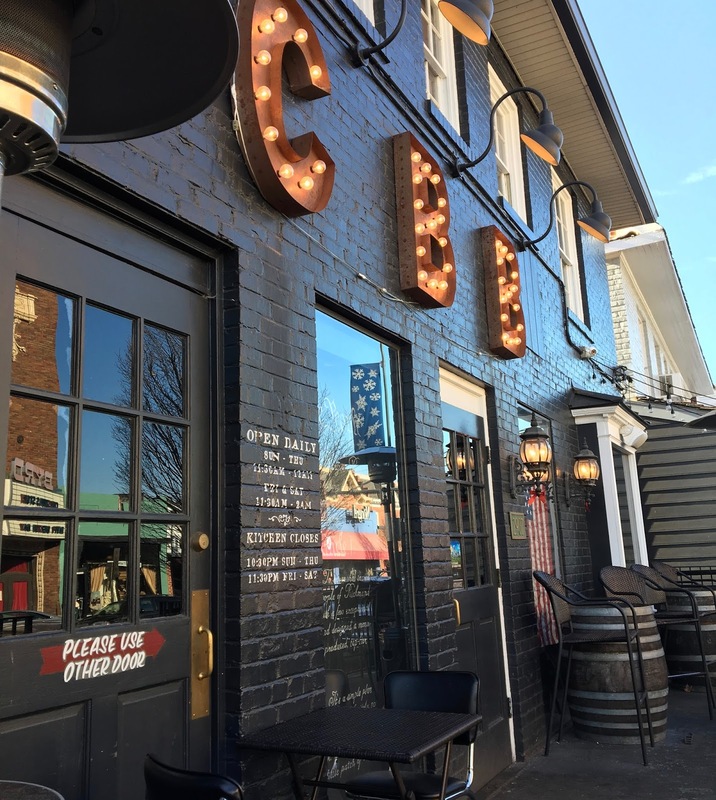 The restaurant has been on my to-try list for awhile, but their Virginia and Maryland locations were just a bit out of range for grabbing a meal after work. 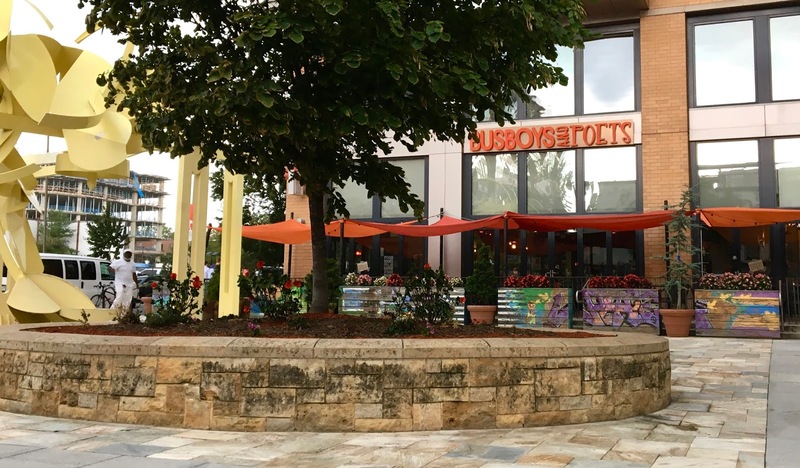 However, an opportunity presented itself when my aunt came to visit, and happily agreed to venture beyond the District to Not Your Average Joe's Reston location. One of my favorite places to visit in Washington D.C. is the Washington National Cathedral. The grounds around the nation's spiritual home are incredibly serene and the interior of the cathedral is magnificent featuring intricate carvings, beautiful stained glass, and an incredible history that is entwined with some of the most notable events and people of the 20th and 21st centuries. The National Cathedral tops the list of places I take out-of-town visitors, so when my aunt visited we planned to spend a morning exploring the Cathedral with one of their amazing tours. After a full morning, we were ready for a bite of lunch, and decided to eat at Open City, the Cathedral's resident cafe. 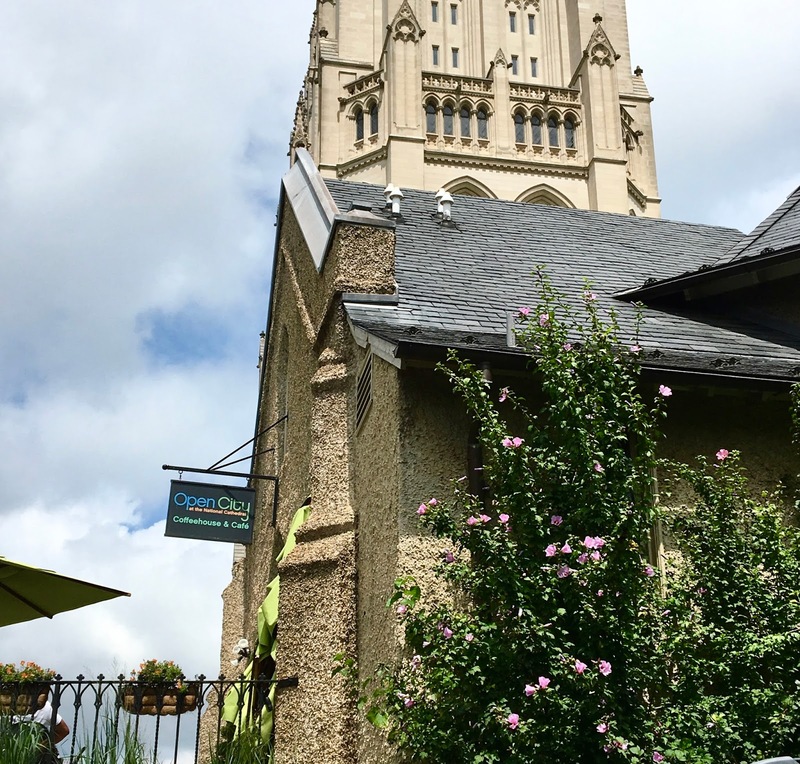 I had heard of Open City's gluten-free friendliness through Find Me Gluten Free and was excited that they had an outpost on the National Cathedral's campus- which eliminated the need to catch a Lyft ride to their original Woodley Park location. This post features menus for Not Your Average Joe's. To check out my full review, click here. In following other gluten-free bloggers, I have heard incredible things about the restaurant chain Not Your Average Joe's. In a world where gluten-free dinners are lucky to get a menu with symbols indicating gluten-free fare, Not Your Average Joe's set out to change the paradigm around gluten-free eating- starting with creating a lengthy gluten-free menu with a dazzling array of options. From their first location in Dartmouth, Massachusetts in 1994, Not Your Average Joes has expanded to over 20 locations across the northeast and mid-Atlantic. 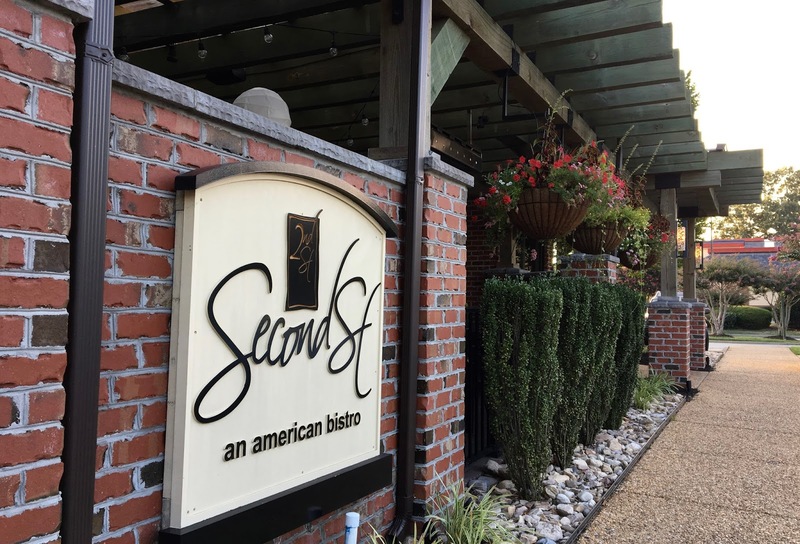 What sets them apart from other similar restaurants is their focus on from-scratch cooking and each restaurant's in-house chef. Because food is made-to-order gluten-free and/or allergy dining is barrier-free, and I enjoyed the feeling of normalcy in being able to choose from such a robust array of options. While I have explored Washington D.C.'s many neighborhoods and eaten all over the nation's capitol, I have not spent much time in the surrounding areas- such as historic Alexandria just a Metro ride away. After spending a morning exploring George Washington's estate- Mount Vernon- I decided to stop by Alexandria for lunch. 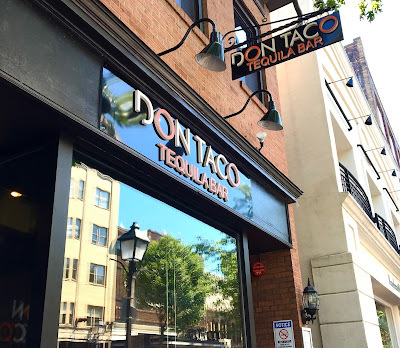 When exploring options for where to dine, Don Taco caught my eye because I am always in search of good tacos. With lots of gluten-free options marked on their menus, I decided to set my sights on a late lunch there. 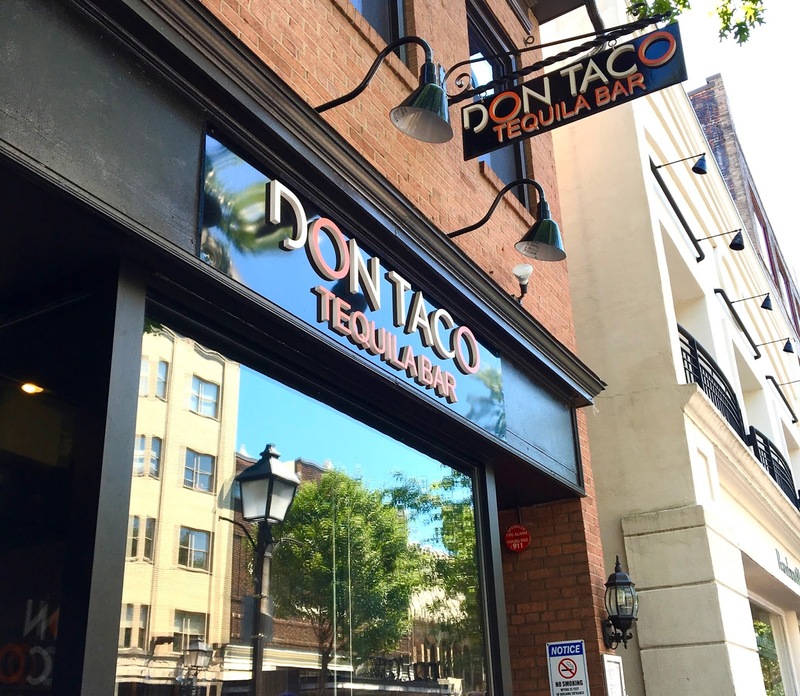 Located on historic King Street, the dining and shopping heart of old town Alexandria, Don Taco combines traditional Mexican flavors with modern elements. 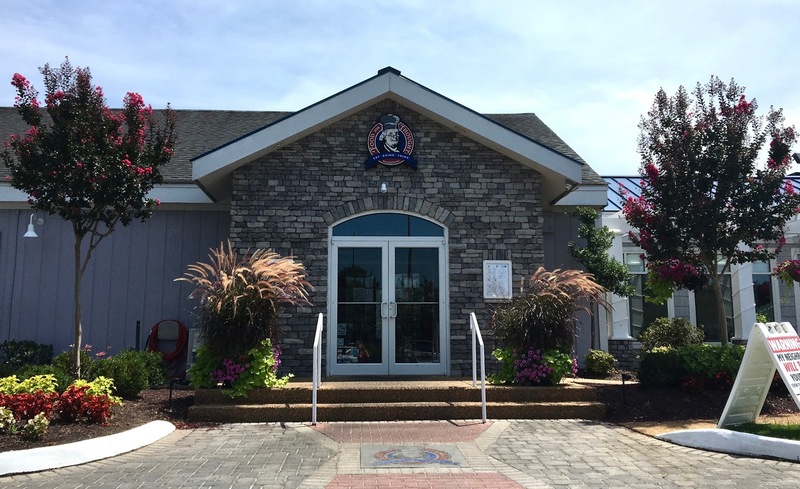 When passing through Williamsburg, Virginia last month I stopped by Food for Thought after reading amazing reviews about their gluten-free menu and know-how when accommodating gluten-free diners. Usually I debate about where to stop when traveling, but to me the choice was clear. Located just outside the historic district, Food for Thought is a restaurant with an ethic that gluten-free diners deserve a seat at the table- and the same experience when dining out as those without food restrictions. With a focus on good food and thought provoking conversation, it's a change from many dining experiences where the focus on speed and fascination with smart phones change the dynamic. 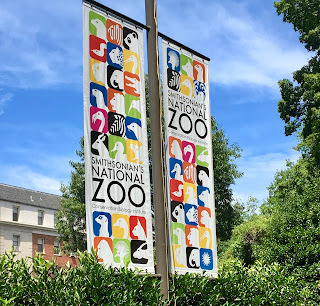 One of my favorite places to go in Washington DC is the Smithsonian's National Zoo. Whether I go for a quick visit or spend the whole day there, I love the thrill of seeing animals from around the world up close and personal. The best thing about the National Zoo is that it is completely free to enter 364 days a year (they are closed on Christmas Day). Located in the Woodley Park neighborhood away from the hustle and bustle of the National Mall it's a retreat from city life and a chance to explore the beautiful grounds of the park. Typically when I visit the National Zoo I bring a packed lunch or a few snacks because they allow visitors to bring outside food and non-alcoholic beverages into the park. This makes planning gluten and dairy-free travel a breeze, but on a recent visit I forgot my snacks at home so walked around to see what options I could find. As a gluten and dairy-free blogger, one of the perks of my job is having the opportunity to sample new-to-me products and discover new companies. Recently, Simple Kneads extended an offer for me to try their gluten-free breads, and given the opportunity to taste test sourdough-type breads I couldn't say no. Simple Kneads was founded in one father's pursuit of delicious gluten-free bread for his son. Finding only subpar options at stores, he turned to real ingredients to see if he could make a bread that was hearty and delicious while being nutritious too. The resulting breads are top eight allergen-free, and arrive looking and smelling like they were baked that morning in a local bakery. I was definitely sold on the story behind the bread and couldn't wait to see how their taste and texture measured up. 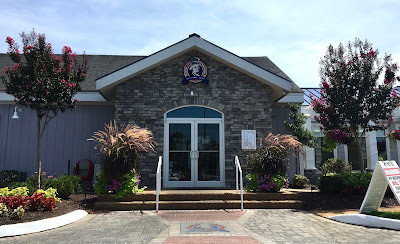 When traveling through the Virginia Peninsula last week, I knew that my mom and I would be passing through the city of Newport News around dinnertime so I did some research to see what would be out best bet for gluten-free eats. 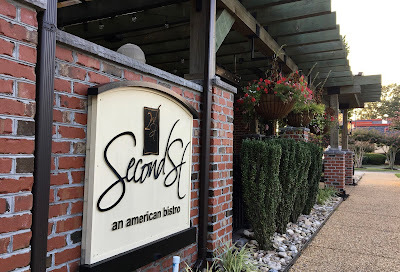 Second Street, an American bistro jumped out because they not only had good reviews on Find Me Gluten Free but had a separate gluten-free menu too. After a day of fighting heavy traffic, we both were looking forward to a good meal before hitting the road for the last few miles to our destination- Norfolk. The location I stopped by is one of two Second Street locations, the other being their original restaurant in Williamsburg just a few miles up the road. When people ask me for restaurant recommendations in Washington D.C., Busboys and Poets is usually my first suggestion because it has a perfect trifecta of great food, friendly staff, and an great line up of programs that inspire conversation and connection. Although I have frequented Busboys and Poets several times for lunch and dinner, I have yet to visit for brunch, so I was sure to put it at the top of the list of things to do when my mom came to town to visit over the weekend. 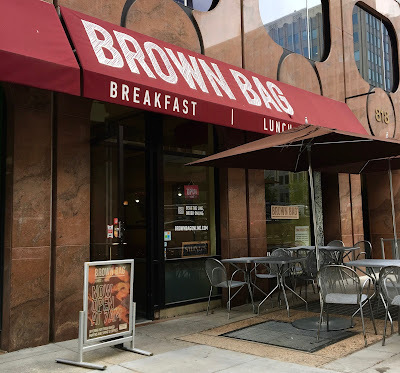 From prior visits I have been impressed by Busboys and Poets' expansive gluten-free options, so I was excited to have a "normal" brunch experience despite my dietary restrictions. 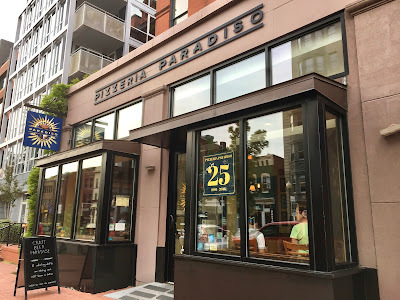 After a successful visit to Veloce, a fast casual pizza place in Farragut Square neighborhood (see my review), I knew a visit to Pizzeria Paradiso was in order to try out their original pizzeria concept. One unique thing about Pizzeria Paradiso is that they place the emphasis on perfecting their pizza crust. As a gluten-free diner, I'm used to soggy, sad, and altogether subpar crusts, so I definitely had some raised eyebrows going in about how that mission would translate to the finicky world of gluten-free crusts. 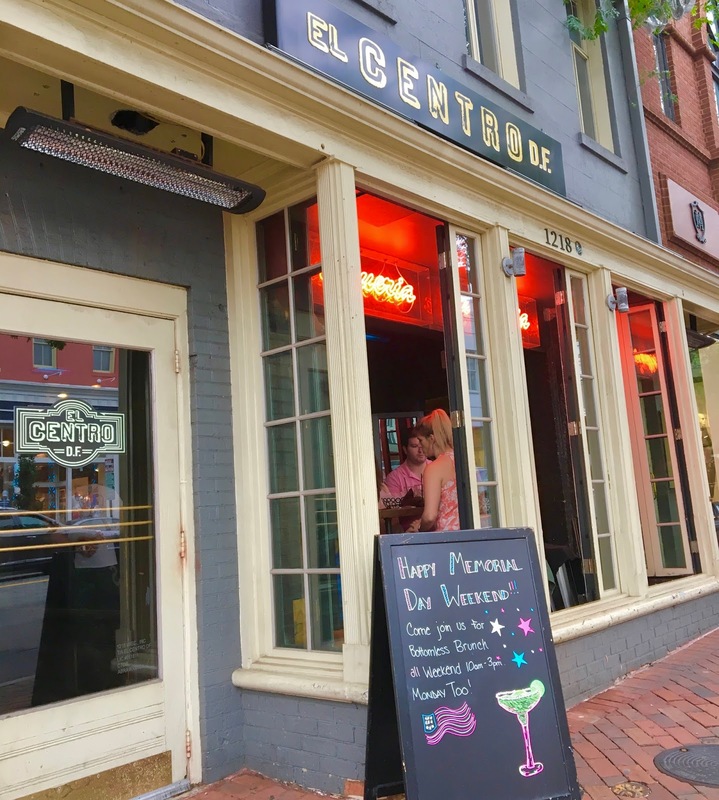 I decided to visit their Dupont Circle location, which is located in one of my favorite neighborhoods in the District. With a lovely outdoor patio and cozy feel, I was excited to see how Pizzeria Paradiso's pizza would measure up. This post features menus for Food For Thought. To check out my full review, click here. When I knew I would be traveling from Washington D.C. to Norfolk, Virginia this summer, I was excited to be passing by the historic Revolutionary War-era cities of Williamsburg and Yorktown. Although I couldn't stop and explore for too long, I did seek out a restaurant to stop for lunch when passing through. Food for Thought quickly rose to the top of restaurants I was considering due to their commitment to gluten-free diners and rave reviews I found online. 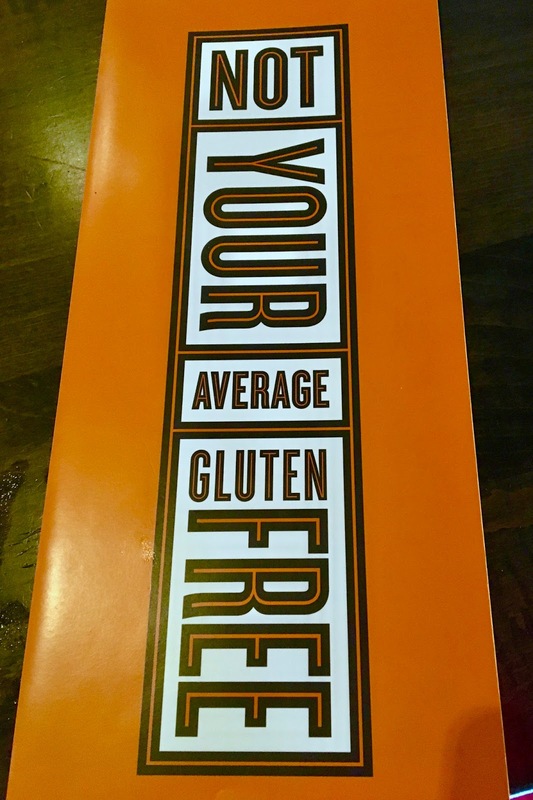 When I arrived, I immediately fell at ease when I was handed a full gluten-free menu, and was greeted by the knowledgable staff. Barbecue can be difficult to navigate for people with food allergies. With sauces, rubs, spices, and meats that are all at risk for hidden gluten (or other allergens), I have had limited luck in finding safe BBQ. 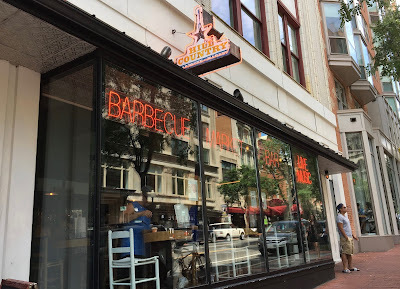 When walking around Penn Quarter, Hill Country Barbecue Market caught my eye because they always seem to be busy. I did some research, which suggested that they were pretty gluten-free friendly, so decided to check them out for lunch. Hill Country Barbecue Market prides itself on serving Central Texas-style barbecue, complete with a full smokehouse in the restaurant. Promising succulent meats, hearty sides, and uncompromising flavor, I was eager to see if they would live up to recently earning the "Best BBQ" crown from The Washington Post. Although I live a pretty healthy lifestyle, there are times when I don't always eat as many nutrient-rich foods as I could. That's why I am a big fan of smoothie/acai bowls, which pack nutrition into every spoonful. 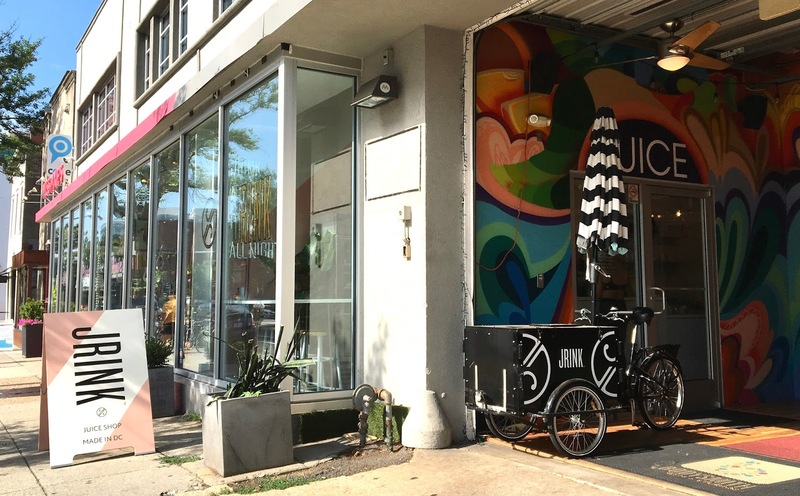 Jrink is a juice shop here in Washington D.C. that has several locations around the city. I've passed by their locations before but for one reason or another did not stop in to order. On a sleepy Saturday morning, I decided to finally check out their fare after a particularly hot week left me feeling me out of whack. With a menu full of cold pressed juices designed to boost your health, I was eager to see if I could find a beverage to meet my needs. For a city with such a rich and diverse array of culinary options, there's are surprisingly few dedicated gluten-free bakeries here in Washington D.C. I know several popular bakeries around town offer gluten-free options, but cross contamination concerns and finding gluten and dairy-free options has made me steer clear of those popular places. While enjoying brunch on the busy 7th St restaurant-dense corridor last weekend though, I decided to pop into Red Velvet Cupcakery on whim, wondering if they had any safe options. Knowing that I'd probably strike out, but taking the chance anyway, I was delighted to discover that they not only had gluten-free options, but every one of those was vegan as well. On the spot I bought one of every flavor and eagerly awaited my taste test of each cupcake. Although I consider myself to be pretty adventurous food-wise, I am ashamed to admit that I have a limited experience with Korean fare. In doing research to find new foodie spots to try, I stumbled across Mandu, a homestyle Korean restaurant that promised many gluten-free options. With many positive reviews and online menus indicating gluten-free awareness, Mandu has been on my list of places to try soon. 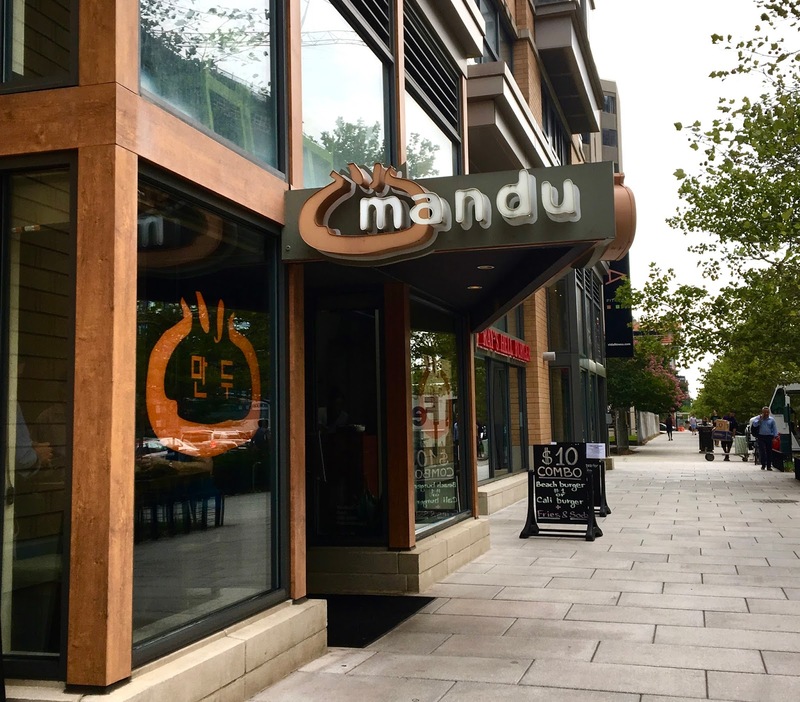 Located in the bustling Mount Vernon Triangle neighborhood, I stopped by Mandu after work and was excited to learn more and try something new. Chef Jose Andres and his menagerie of restaurants are a hometown favorite. As a foodie with dietary restrictions, I have even more reason to love Andres' restaurants beyond their creative menus and consistently delicious food because they across the board know how to accommodate food allergies. With allergen menus, trained staff, and a working knowledge of the intricacies of accommodating allergies and restrictions. Last weekend, I decided to check out Andres' Peruvian fusion restaurant China Chilcano after hearing rave reviews from my coworkers. I decided to venture out for brunch on a summer Sunday morning, and couldn't wait to see if the hype was truly to be believed. This is a post featuring the allergen menus of China Chilcano. To read my full review, click here. As a Washington D.C.-based foodie, I am a huge fan of our hometown super chef Jose Andres. His restaurants are innovative, creative, and are consistently stellar when dealing with food allergies. With restaurants ranging from fast casual to high end, there's a Jose Andres restaurant for any budget. 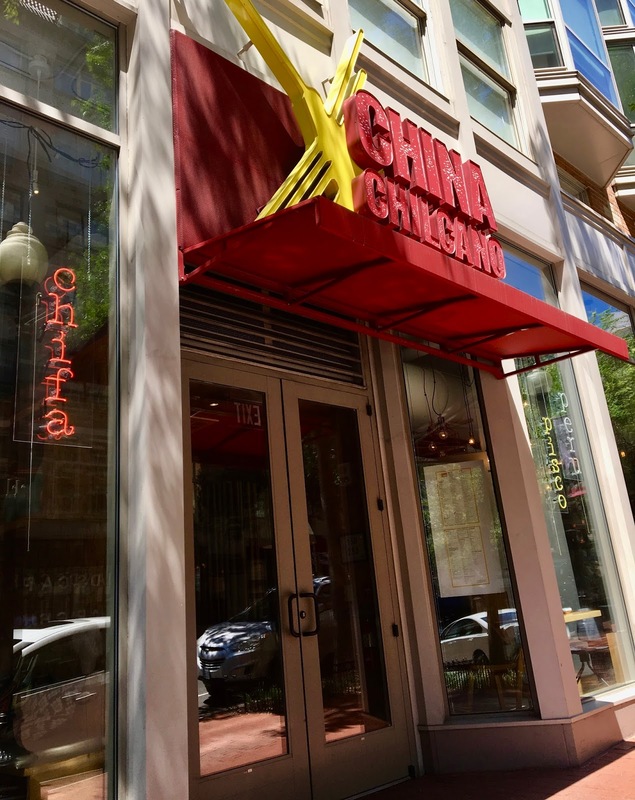 Recently I decided to check out China Chilcano, Andres' restaurant that celebrates the culinary traditions of Peru through Chinese and Japanese cooking techniques. As with most of his other restaurants I have tried, when I mentioned that I had dual dietary restrictions, the staff were quick to bring out their dedicated allergen menu. This post features snapshots of that menu, which details not only gluten-free and dairy-free friendly dishes, but also other allergens that can be removed from each dish. Vegetarians and vegans too can learn what's safe through the extensive markup of the menu. Summer is in full swing, which means that I'm trying to seek out as much fun in the sun as I can before I have to go back to school. As a fan of the performing arts, I started the summer with a list of performances and venues around the Washington D.C. area I wanted to check out and Wolf Trap National Park for the Performing Arts topped that list. Located in Vienna, Virginia, Wolf Trap is located on 117 acres of woodlands and hosts a wide diversity of acts ranging from musical theater to top music acts, author readings to movies with a live symphony. There's something for everyone in the summer lineup, and something going on almost daily during the summer months. Since purchasing a high-powered smoothie blender several months ago, I have cut down on ordering smoothies when dining out. Most store-made ones have sky-high sugar levels, and I like to control what goes into my custom blends. 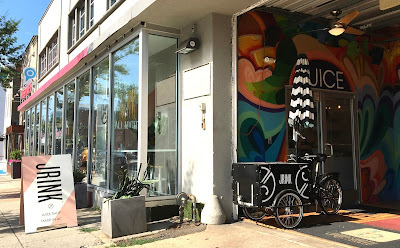 I have had South Block on my list of places to try for months now, and when I was in the neighborhood of Union Market, I decided to stop in and give them a try. With a menu featuring smoothies, juices, and other health-focused fare, I love that South Block's offerings are made with real ingredients that are friendly to those with special diets. Despite being able to make my own blends, it is nice treat to break up my usual routine with an occasional stop at a smoothie or juice bar to get inspiration for new flavor combinations. Knowing that South Block's philosophy of using real food aligns with mine, I had a positive feeling about them before walking in. If there is one down side to working on the National Mall, it's that gluten-free food options are pretty scarce or quite a few blocks away. Because of the heat and humidity of summer in Washington D.C., I find the idea of a long walk for lunch rather unappetizing. After talking with colleagues, I have heard some pretty amazing things about Mitsitam, the museum cafe at the National Museum of the American Indian. With a menu showcasing indigenous food from the Western hemisphere, I guessed that the cafe would have several gluten-free options. Mitsitam translates to "let's eat," which is a perfect name for this cafe, as it features several serving stations that profile cuisines by region. Diners can choose to sample foods from many traditions, and there are gluten-free food options at most stations. Of all the world's cuisines, Mexican food is near and dear to my heart because most of it is corn-based and gluten-free friendly. From tacos and guacamole to tamales and horchata, I love the diversity and bold flavors of Mexican delicacies. On the recommendation of coworkers at my internship site this summer, I decided to dedicate my Sunday to exploring Eastern Market, a wonderful menagerie of produce stands, artists selling their wares, and food vendors. I went mainly for the produce and art, but along the way stumbled into Manos de Maiz, a pop up vendor offering an 100% gluten-free menu featuring maizope. This delicacy features a thick corn tortilla layered with seasonal toppings. I have never encountered this type of food before, so was excited to try it out. If I had to choose an official beverage of summer, limeade makes a pretty good candidate for the honor. I often associate this refreshing brew with street fairs and markets, and love how it perfectly blends sweet and sour. While exploring around the colorful menagerie that is Eastern Market, a combined farmers' market and flea market in the Capitol Hill neighborhood of D.C., I wandered through the food vendors, not quite sure if any would be gluten and dairy-free. 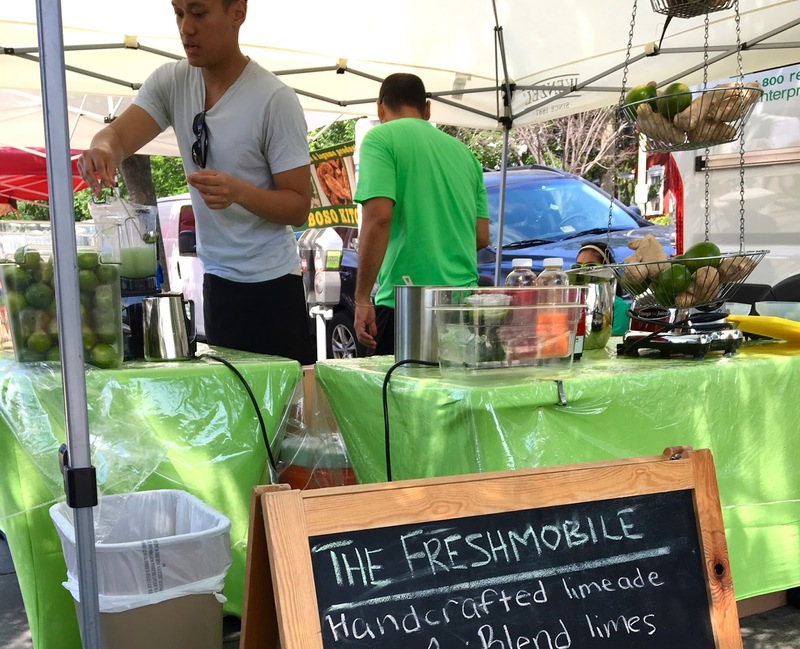 When walking by the Freshmobile booth, which was stocked with fresh fruit and veggies, I was offered a sample of their unique limeade, which is unlike anything I have tasted before. Impressed by the drink's refreshing flavor, I bought a full serving on the spot. 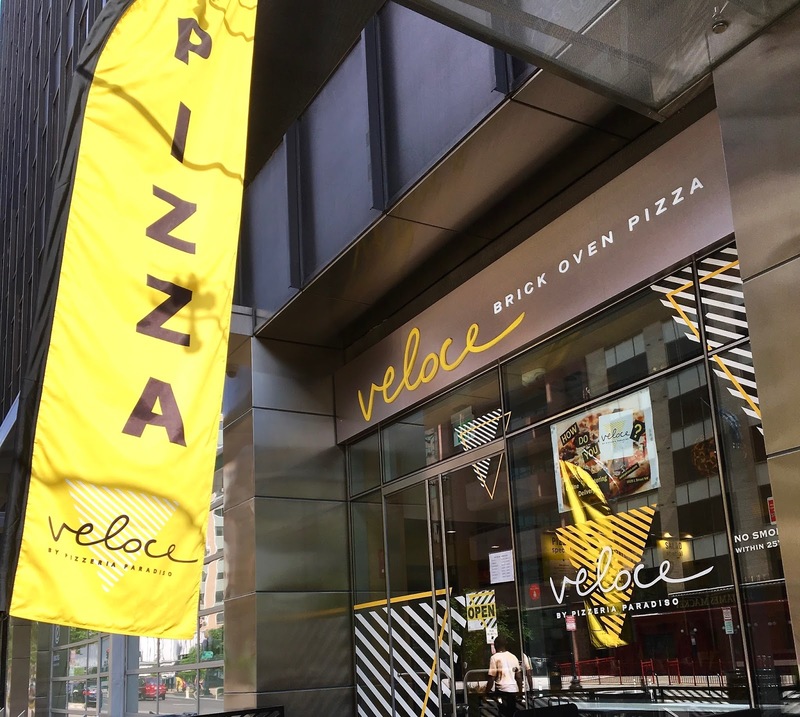 As of December 15, 2017, Veloce has closed its doors. I'm sad to see this GF neighborhood mainstay go away. Gluten-free pizza gets a bad rap, and I think that reputation is partially justified. Most pizzerias that serve up gluten-free pizzas serve up soggy or cardboard-like facsimiles of the real deal and charge twice the price. After finding really good pizzas at a few pizzerias, I have shied away from rushing out to try every gluten-free pizza out there. 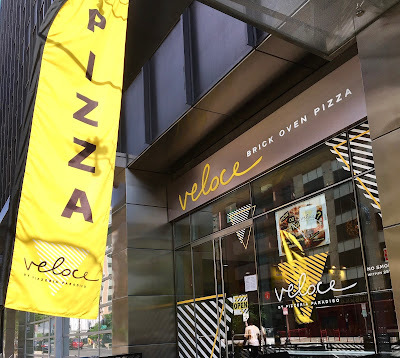 When a strong craving for pizza struck this weekend, I researched neighborhood pizza options and stumbled across Veloce, the fast casual cousin of Pizzeria Paradiso, a popular D.C. pizza restaurant. Promising quick-cooking pizzas that don't compromise on gourmet ingredients, I decided to pay them a visit. If it went well, I would have a reliable pizza chain, if not, I was prepared to walk away so as to not risk getting glutened. 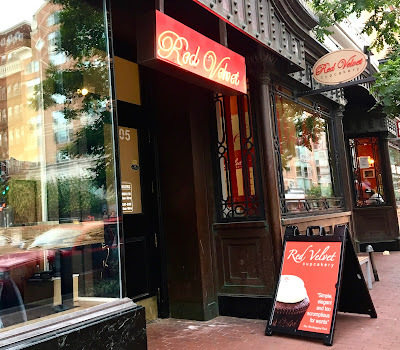 There's so many great places to grab an affordable gluten-free lunch in Washington D.C. that it's totally an embarrassment of riches. The only downside is that most lunch places open up around the lunch hour. While this makes logical sense, I like being able to pick something up on my way into work so that I can have food on hand if my coworkers want to go out to a non-gluten-friendly place for lunch. Fortunately, Brown Bag has set their hours to be a solution to my dilemma. Opening early in the morning, they serve up lunchtime eats so that commuters can beat the lunchtime rush. 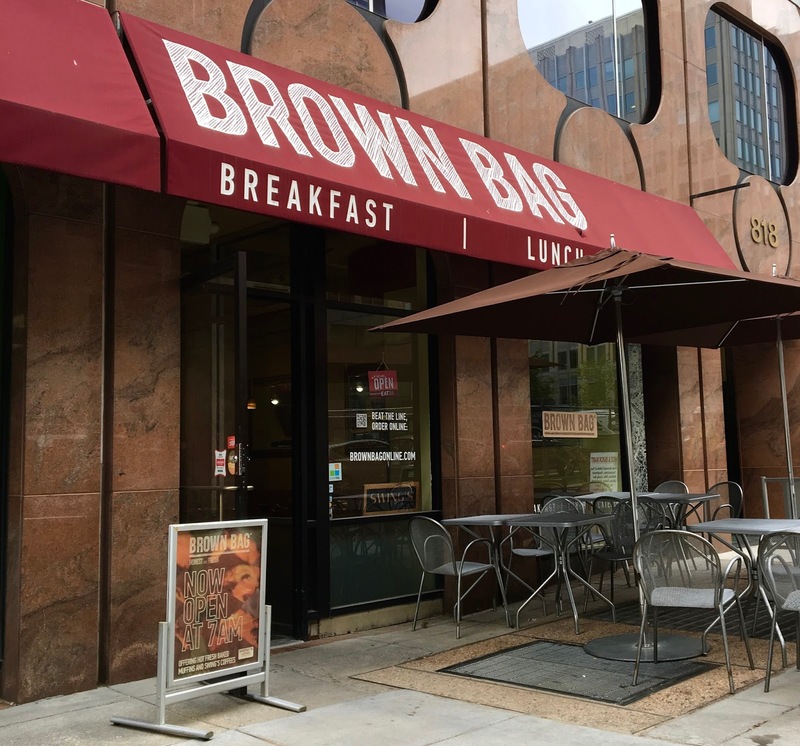 Brown Bag promises the their fare is made fresh in-house using clean ingredients and scratch cooking technique. With gluten-free options such as noodles and salads, I was intrigued to see just how gluten-aware this cafe would be. Now that I am settled in to my new neighborhood in Washington D.C., I knew I wanted to find a good Thai food restaurant nearby because it was one of my favorite types of food. Whether dining in or getting take-out, I like to have several options nearby. As I checked out local Thai restaurants, Soi 38 jumped out to me thanks to rave reviews I saw online and gluten-free markings on the menu. While many Thai dishes are naturally gluten-free, it's reassuring to see a restaurant proactively label which items are safe. 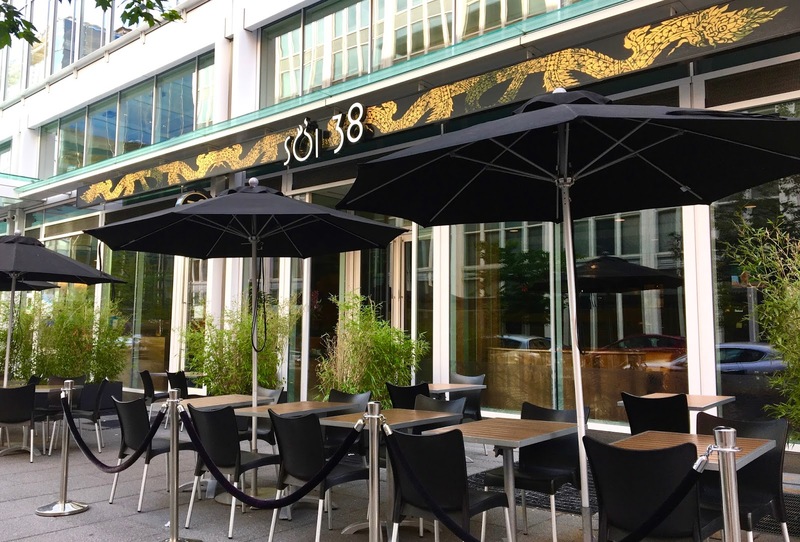 Soi 38 is located in the Foggy Bottom neighborhood and features cuisine inspired by Bangkok's night markets. With a blend of familiar favorites and fusion street fare and the menu, dining at Soi 38 promises authenticity and adventure. If there's one restaurant trend I can wholeheartedly get behind, it's the proliferation of fast casual "make your own bowl" restaurants that have popped up in and around Washington D.C. They make grabbing an affordable, healthy lunch easy, and coming many culinary varieties- Mediterranean, Indian, Korean, and more. 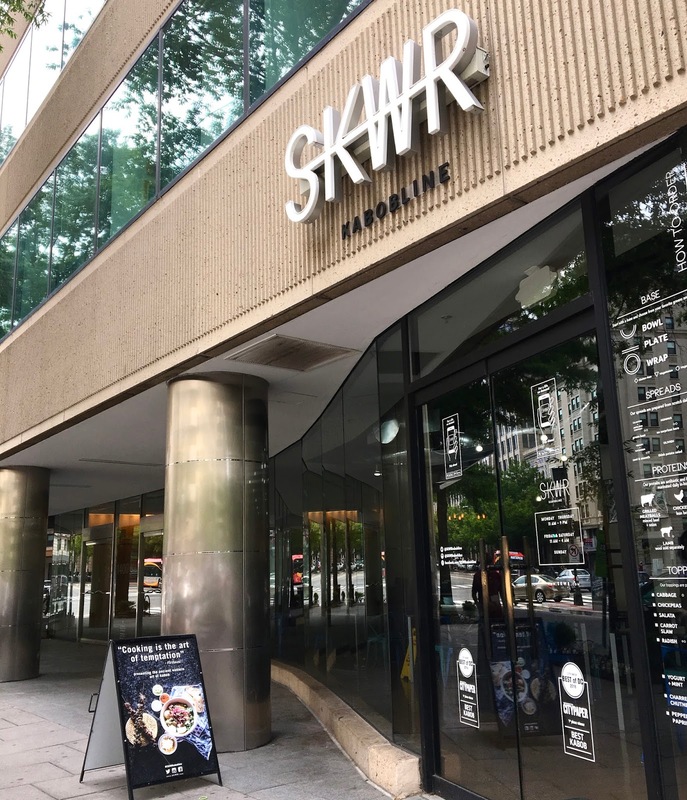 The latest of these type of restaurants I visited is SKWR Kabobline in downtown D.C. Offering a gourmet take on a street vendor staple- kabobs- SKWR has a menu that features naturally gluten-free and dairy-free options. SKWR's food is made in-house, and merges traditional and modern influences. Named for the traditional way of cooking meat- slow roasting over an open flame, SKWR makes ancient eastern eating approachable and fun. As a student and intern, I know the importance of always having safe food on hand to avoid situations when I am stuck without a safe snack. 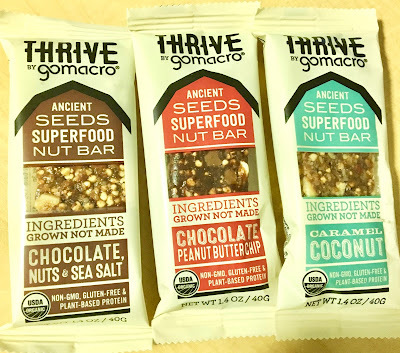 Usually I always have a Go Macro bar (or two) in my backpack at all times, and love them for their clean ingredients, reduced-sugar recipes, and high amounts of plant-based protein. 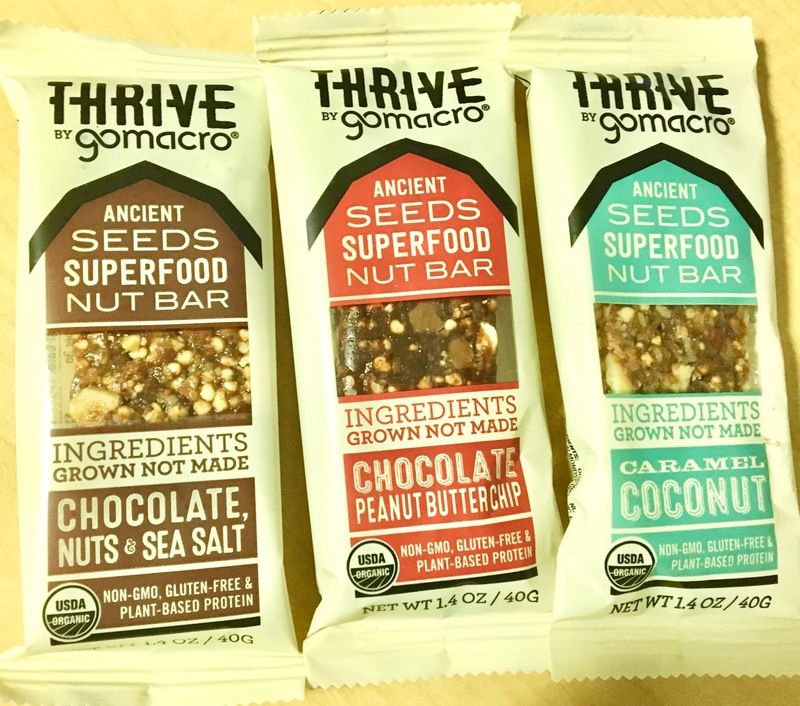 These aren't your typical bars that are candy disguised as health food- no, these have real substance. That's why I was super excited to see their new line of bars at my local Whole Foods Market. Called Thrive, these have the same short ingredient lists and plant-protein content, but are infused with ancient seeds and superfoods. Non-GMO, gluten-free, organic, and vegan, these are sure to please kids of all ages, and are an easy, delicious solution to your afternoon snack dilemmas. 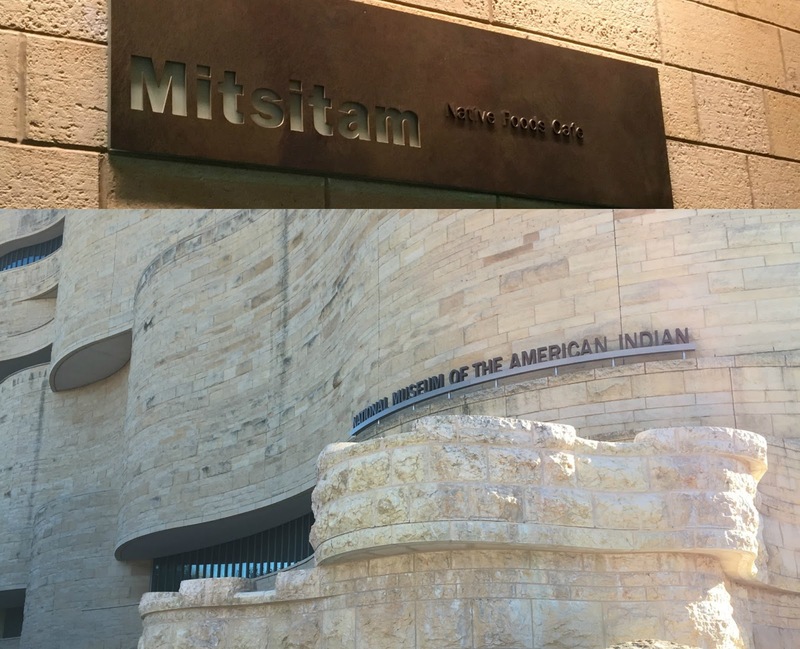 Over the long Memorial Day weekend, I moved from Baltimore to Washington D.C. for the summer, which means that there's a whole lot of D.C. reviews coming soon to the blog. After a long day of packing and moving, I decided to venture over to Georgetown to walk around and get fresh air. To decide where to find dinner, I consulted my Find Me Gluten-Free app, and after reading reviews decided to give El Centro D.F. a try. With a menu featuring authentic Mexican eats, El Centro D.F. has a lot to offer for gluten-free eaters. From tacos to fajitas, enchiladas to salad, corn-based tortillas make most of the menu gluten-free. El Centro D.F. is one in a few restaurants operated by Mexican-born chef Richard Sandoval. Inspired by the flavors of Mexico City, dining at El Centro D.F. promises to capture the essence and authenticity of meals he enjoyed with his family growing up. The roar of the crowd... the crack of the bat... baseball season is in full swing (pun intended)! 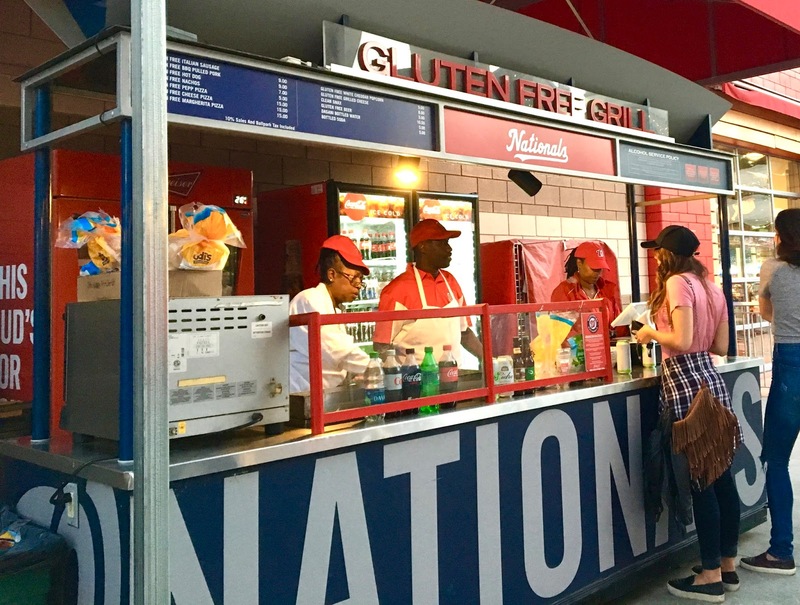 While everyone can join in on the fun of cheering on the home team, baseball stadiums can be difficult to navigate as a gluten-free eater because hot dogs, pretzels, and other gluten-filled snacks are the staples of concession stands everywhere. Luckily, Nationals Park in Washington D.C, home of the Washington Nationals, has taken steps to include gluten-free eaters into the full experience of visiting the ballpark- hot dog and all. With a 100% dedicated gluten-free concession stand, and food policies that allow you to bring in outside food, it's easy to plan ahead to enjoy an afternoon or evening at the ballpark. 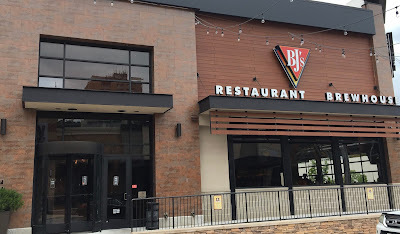 As I wrap up my time in Baltimore (for now) I made one final foodie stop before heading out of town at BJ's Restaurant and Brewhouse in Towson. I have heard for awhile that BJ's has lots of gluten-free options so I decided it was finally time to check them out. 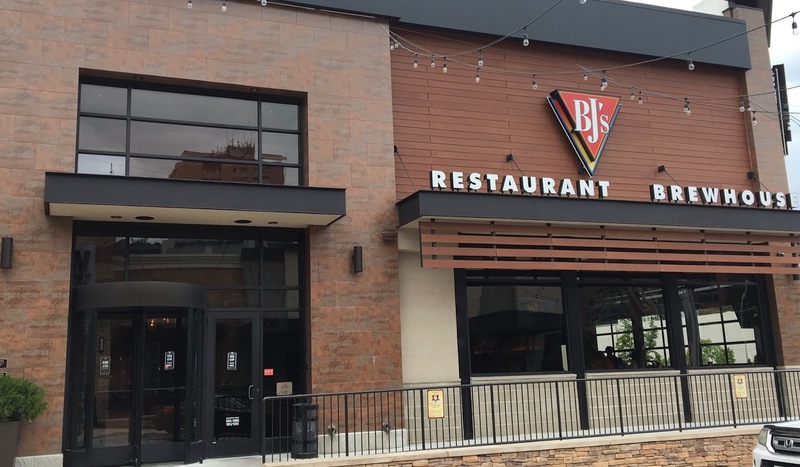 This BJ's is part of the new Towson Square development, which features restaurants, a huge movie theater, and tons of shopping nearby at Towson Town Center. Their menu is lengthy, an there's a lot of options for those with food allergies and dietary restrictions. I arrived for late lunch, and was eager to see how my experience compared to my expectations.